1)It's said in the description that you offer VKontacte, but I don't see an option to have its button displayed like the rest, even though this social network is in that list that's displayed when the user clicks the Share and then More buttons. Any way to have VKontacte's button there like the rest? 2)Is there a way to fully align the counters and display all of them with the exact same size? If you access the page below, you'll see that Pinterest's counter is far smaller than the others, and also that the bottom line of Twitter's counter is slightly lower than the bottom line of Facebook's counter. 3)Sometimes that "Share" button that's displayed by last doesn't show the other social networks when passing the mouse over it, in a way that users have to click on it and get redirected to another page displaying those social networks. It seems to be happening randomly though. Any way to fix this? Response - I noticed that different tabs in dedicated auction page were not clickable and found that there is a plugin installed called Social Sharing Toolkit which is giving JS errors inside console. When this plugin is deactivated then shipping and tabs work fine. Hence this plugin is the culprit. I also noticed via JS errors that you might have shifted your site from http to https and all links on your site were not shifted from http to https and that is why Social Sharing Toolkit plugin is throwing JS errors. I would recommend you to solve those JS errors and then use Social Sharing Toolkit plugin or else use all together different plugin for social sharing. You'll see there's a custom CSS tab there, the last one, which might help here. Could you please point me to this information? I'm really not sure to what you are referring to and would like to double-check that our description is accurate and up-to-date. Thanks in advance! These buttons a created by the social sites, not by the plugin itself. You can use all the available plugin's options to affect the design and add some custom CSS styling to it but I believe there's no simple way to style/change these buttons directly without a lot of custom coding. I already had a chance to address this question of yours :slight_smile: Could you please follow up in this (original) thread? Thanks! LOL, that first part regards what's what Social Sharing Toolkit's page, it's said they offer the VKontakte button. I've actually never used VK myself, but I'm presuming they have a share button too, right? So, this is the button I want to have. I've just realized after creating these two therads that they're about pretty much the same thing (issues generated by Social Sharing Toolkit), so if that's better for you, we can simply keep the discussion at only one of them, whichever you prefer. I got rid of Social Sharing Toolkit, I'm now using AddThis Sharing Buttons. Can you please check if everything is ok, especially regarding that https issue? 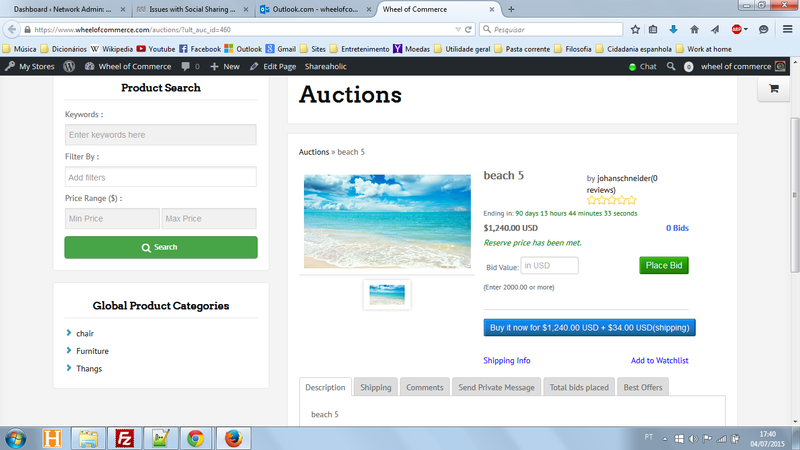 Sorry for posting here again, but I forgot something: at https://www.wheelofcommerce.com/auctions/?ult_auc_id=460 the buttons "Buy it now" and "Place bid" are unaligned, misplaced. There's also that "(Enter 2000.00 or more)", which is also unaligned -it should be right after the "Place bid" button to indicate the minimum bid. They're all sort of overlaping one another. How do I fix that? 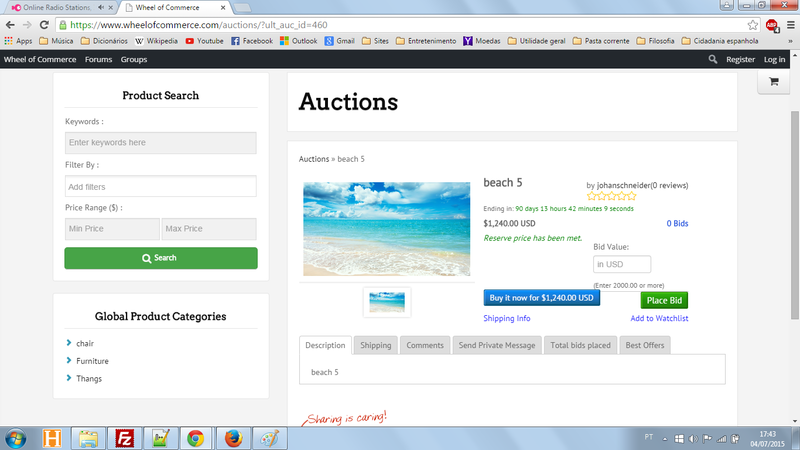 I've detected an issue regarding where the buttons are being displayed at the auctions section. They're showing only at the description tab, instead of right beneath that panel with the tabs -this way it would be displayed no matter at which tab you are. Any way to fix this? While they don't look to be overlapping each other presently (see attached screenshot), it looks like the plugin code would need to be customized for this, since the way the HTML code for the sections is laid out puts a bit of a damper on using CSS alone to re-adjust the items as you're wanting them to be adjusted. I was just about to post here, haha. I was checking Shareaholic settings and I'm unable to verify my site with them. Since you're the one who added the plugin, do you have any idea why that might be? Because I've checked my account with them and everything seems fine. Can it have something to do with my home page redirect? How do I remove/hide the social buttons at the following pages? Do you still require assistance with this part? -I'm still seeing the social buttons at my login page, I'm presuming they're being displayed at the registration too, as the solution you tried is the same for both. -Yes, I still need help with Shareaholic, since they didn't answer me, and considering the "We're experiencing an unusual high volume of emails" automict response I got, I'm presuming I won't be hearing back from them any time soon. It looks like the plugin is adding display block with script so I had to override it by using !important in CSS code, even tho I'm not a fan of using it there is no other way to do it.